Italian-seasoned grilled chicken breast served on a brioche roll with fresh mozzarella cheese, tomato, arugula, pesto mayo and a balsamic glaze. Angus steak burger (1/2 lb.) served on a warm brioche roll with lettuce, tomato, onion and your choice of cheese. Two crab cakes (broiled or fried) served with house-made remoulade sauce, fries and cole slaw. oceanfront dining, outdoor seating available, family oriented, casual, relaxing. Reservations recommended for large parties (over 8). Call ahead. 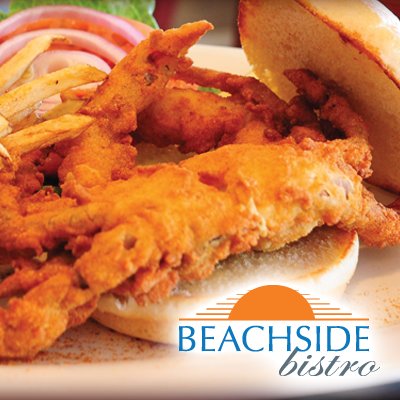 Join us at the only true oceanfront dining on The Outer Banks!